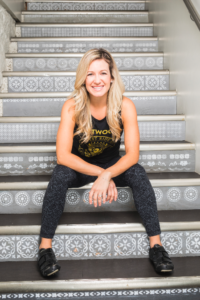 Next in the series is Steph Morris, founder of Strut Dance + an Eastwood Luminary. In my newest role as Mommy, days revolve around my little girl, Sophie. If we could, we would spend all morning in our PJ’s listening to music and dancing. Balancing fitness/teaching and Mom life, I am blessed to be able to do both. I simply have to move my body every day in order to feel my best and give my best self to Sophie/our family. It’s not easy and most days are met with challenges along the way, yet embracing the madness makes you cherish the special everyday moments. – What made you interested in dance + fitness? All my life I have been a dancer. Having grown up at a competitive dance studio, and later taking this passion onto the court as an NBA dancer, the desire and love of performing is simply part of who I am. Teaching fitness classes became a natural extension of what I already love. Having the opportunity to inspire others through fitness is something that fills me up. I thrive off the energy clients bring, and it feels good to achieve small victories together in a workout setting. – When did you decide to launch Strut Dance? Strut Dance came to be, when my husband and I moved to Vancouver. I had just “retired” from my professional dance career and knew I wanted to keep dance in my life somehow. Strut was created from the desire to share with other women that they are strong and powerful. Each class is curated to instill confidence through dance movement, while also learning to embrace everything that makes us female, through a fun, friendly and welcoming atmosphere. Of course, we have the occasional male take class as well, but it’s in the amazing women that my work is focused on. – How do you strive to maintain balance between work, play + family? Finding balance is something I’m constantly working on. If anyone tells you they have a perfect life balance, they are probably fooling you. For me it’s in the little things, like being present for my daughter instead of looking at my phone all day or having a proper family dinner every night so we can connect and hear about each other’s day. Balancing in part time work has allowed me to stay connected to my passions, while also being full time Mommy which is very important to me right now. I wish I could have told myself to not care so much, to not listen to what other people said, and just BE ME. In my adult life, I actually feel like I still remind myself of this advice often. This is a big question… If you asked me 5 years ago my answer would have been “own a big home and have a nice car.” Yet as I get older this perspective has shifted away from material needs, and into a realm of those things you can only “feel.” (Or maybe its changed just because we live in Vancouver ☺ ). I am so lit up when I am able to inspire others to be their truest selves. Whether it be on the bike, or in a dance class, or in my youth mentorship, I feel building up the self-esteem and confidence of those around you is such an important impact to make on the world. TUT, a note from the Universe. It’s a daily email message that I receive with wonderful gems of advice and perspective that helps me learn and grow. Tough to choose one! Virtuous Pie, Parallel 49 Coffee (almond Chai highly recommended), or everything on the menu at the Juice Truck. Quarry Rock… all so I can have a Honey’s donut at the end! All day, anytime, love them all!